This guidance document was prepared on behalf of the International Council for Standardization in Haematology (ICSH) for providing haemostasis-related guidance documents for clinical laboratories. This inaugural coagulation ICSH document was developed by an ad hoc committee, comprised of international clinical and laboratory direct acting oral anticoagulant (DOAC) experts. 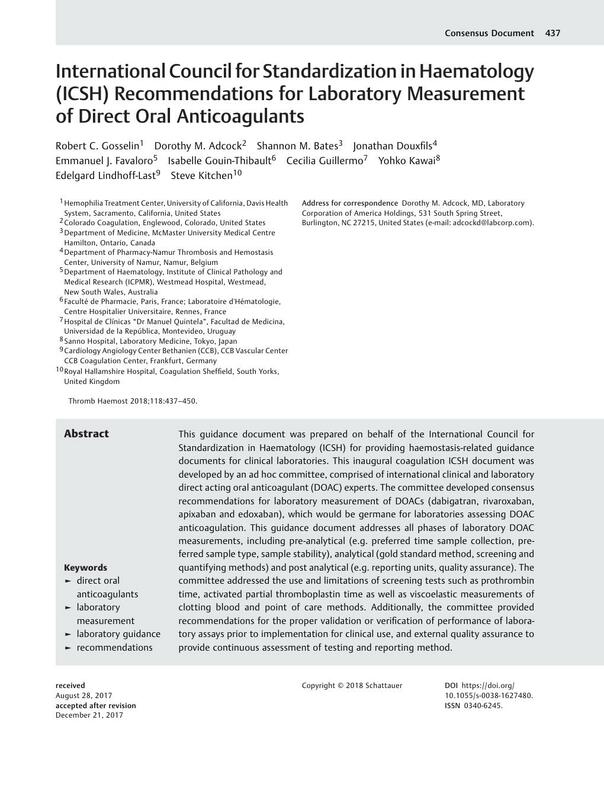 The committee developed consensus recommendations for laboratory measurement of DOACs (dabigatran, rivaroxaban, apixaban and edoxaban), which would be germane for laboratories assessing DOAC anticoagulation. This guidance document addresses all phases of laboratory DOAC measurements, including pre-analytical (e.g. preferred time sample collection, preferred sample type, sample stability), analytical (gold standard method, screening and quantifying methods) and post analytical (e.g. reporting units, quality assurance). The committee addressed the use and limitations of screening tests such as prothrombin time, activated partial thromboplastin time as well as viscoelastic measurements of clotting blood and point of care methods. Additionally, the committee provided recommendations for the proper validation or verification of performance of laboratory assays prior to implementation for clinical use, and external quality assurance to provide continuous assessment of testing and reporting method.